The footballer Mesut Özil has become embroiled in a new political row in Germany over reports he asked Recep Tayyip Erdogan, Turkey’s president, to be guest of honour at his wedding. The Arsenal star resigned from the German national team last year claiming he was a victim of racism after coming under fire over his public support for Mr Erdogan. German politicians spoke out after he was pictured with his fiancee, Amine Gulse, meeting Mr Erdogan at Istanbul airport last week. “The fact this is still going on will disappoint a lot of football fans, including me,” Angela Merkel’s chief of staff, Helge Braun, told reporters. Bild, Germany’s highest-selling newspaper, carried reports of the wedding invitation on its front page. 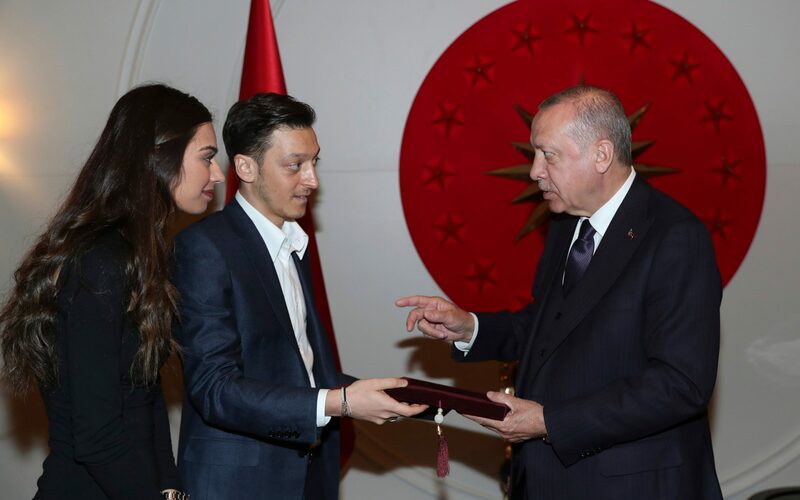 Last year’s extraordinary political row which culminated in one of Germany’s biggest football stars quitting the national team began when Mr Özil and Ilkay Gündoğan, another player of Turkish descent, posed for photographs with Mr Erdogan in London.